My students had 2 exams, both around 30 minutes long and together worth 40% of their final grade. The exams were to be taken in class time, at the same time we usually have class… that is to say, at 9am on Thursday. There are 15 students in the class. At 9am I had about 8 students. 9.05 I had 10 and at 9.15 I had 12. Because I am probably far too kind I waited and we started the exam at 9.20. Between then and 9.30 the total number of students present rose to 14. The 2 last students said ‘sorry I’m late’ and began their tests. At 9.43am, in walks the final student. ‘Sorry I’m late.’ The first exam will finish at 9.50. Another class. Same 2 exams. Class starts at 1pm. Class always starts at 1pm. At 1.10 I have 16 out of 35 students. The last 4 students come at 2.20 pm. That’s an hour and twenty minutes late for an hour long exam. They looked incredibly baffled when I said they had missed it. I’m not going to pretend that I was never late at university level. In fact I remember having a 2 hour Spanish exam unusually on a Saturday morning and jumping out of bed just as it started. But the thing that gets me is…. These are their FINALS. Of course, the majority of my students turned up on time, or a few minutes late, and studied hard. But with every class the pattern of at least one student being more than half an hour late or over an hour late has repeated. Am I… Is this… just… What?! You know what the icing on the cake is? I had to reschedule the exam for the 4 students that came at 2.20 pm. I asked them what time they could do. They said 1 pm. They came at about 2 pm, smiling sweetly. I highly recommend this book for anyone starting out to read the Thai language. The main thing I like about it is that it introduces everything slowly and builds it up gradually. I can string letters together to make the right sounds, but the tones, up until now, have been mystifying to me. I did a simple Google for ‘Thai tone rules’ and was completely overwhelmed by the explanations and the charts! I read a few posts on blogs from people who reckon they have ‘cracked’ the rules and found a way to simplify everything and just got more and more confused. What works for some people doesn’t work for others. I took a deep sigh and a break from the computer and re-scanned my bookshelf. I noticed this book, which I had bought nearly a year ago and not properly looked at. I had been plowing headfirst into children’s books without much guidance or really understanding what I was doing, and was at much the same level as I had been months ago. I needed some drastic action, and realised that this might be the answer to actually improving. The author starts by introducing mid and low class consonants and long vowels, then high class consonants and long vowels. Then she looks at the final sound of the syllable and how it affects tone. There are lots of repetitive exercises to help drill everything into the memory. After that, she moves on to talking about short vowels and how the first and last consonant affect the tone. And so it goes on, gradually building up the rules that you have to remember. I really like the fact that she explains everything, but the majority of the book is reading exercises, which is what it should be. I believe that rather than knowing and being able to recite the tone rule chart off by heart, with enough practice I will be able to see a word and recognise it’s tone from looking at it, which of course, is what I’m aiming for. I already feel confident reading words with the tone rules that I have studied so far, and I’ve only been studying it for a few weeks. I feel like I’m getting somewhere! There is maybe one con for me, that is that I don’t really understand the transliteration that is used. I also don’t really want to spend time learning it as I want to spend that time learning Thai. It’s used to explain what kind of sound the letters make. There’s no CD, so I think that if you don’t know what sounds the letters and vowels make already, it would be difficult to make any sense of it at first. Having said that, there are plenty of videos on YouTube of people showing the Thai letters and making the sounds, so there’s no excuse not to be able to learn it quite fast, if you haven’t got access to a native speak who will go through it with you. The transliteration is also used to for a few exercises that help you spell in Thai for example – ‘write ‘dEEn’ (walk) in Thai. If you don’t understand the transliteration then you can’t do the exercises. How have you found learning the tone rules? What resources have you used when learning to read Thai? I’ve found myself watching lots of ‘My apartment tour’ videos on YouTube from people in various countries. It’s interesting to consider how different people live when they move abroad, I suppose. I figured people might be interested in where I live, too. 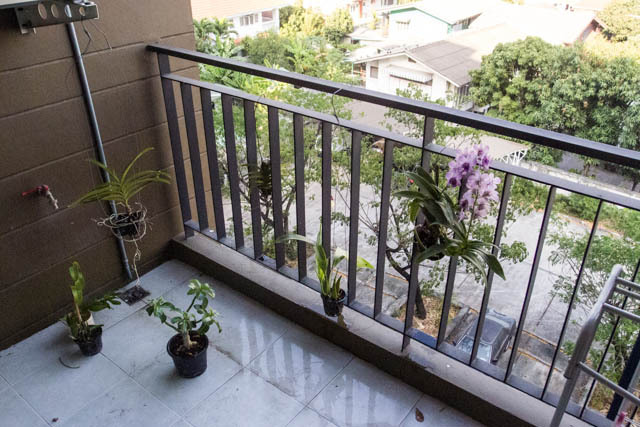 And so, without further adieu, here is a description accompanied by a few pictures, of my lovely apartment in Bangkok for you to feast your eyes on. I live about a ten minute bus ride from the nearest MRT stop (subway), and in the north of the city, near to Nonthaburi, the next province. This is undoubtedly the reason why my apartment is a little cheaper than what I’ve found nearer the BTS or MRT or on Sukhumvit road. I pay 6,500 baht a month. I have a bedroom, a living room with balcony, and a bathroom. It’s quite a new building too, quiet and clean and I really like living here! I bought the sofa and fridge myself, though they weren’t expensive at all. 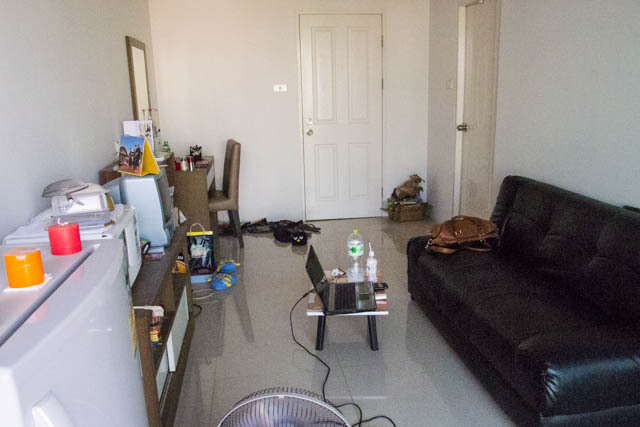 Some apartments in the past have asked me to rent the fridge/TV for 500-1000 baht a month which I have always thought was a little crazy! I was given the microwave and TV for free courtesy of my other half (who doesn’t live with me). No, I don’t have a kitchen. I’ve never had a kitchen while I’ve been living in Bangkok. Food stalls are everywhere outside, and very cheap too. Nearly every supermarket and shopping mall also has a food court where the food isn’t expensive. There is also a restaurant in the apartment building itself which again, isn’t pricey, so I have quite a lot of options. I’ve recently been perfecting the art of microwave cooking too… though so far I’ve managed to explode around 4 eggs while trying to poach them. I recommend scrambled eggs as a far better option for those who would like to try it. Oh, another thing that may be different in other countries, there’s a main door at the front of the building where I have a keycard to get in (and then once I go up in the lift I have keys to my door), and there’s also a reception where I pay my rent or tell them when my lightbulb’s blown etc. It’s quite convenient. Silom Road. A busy area with a drastic juxtaposition of rich and poor; It’s in the business district, where ‘High-So’ people work and also home to Patpong; Go-Go bars and Ping-Pong shows. The shadows of the looming concrete BTS tracks cannot easily be avoided, either. 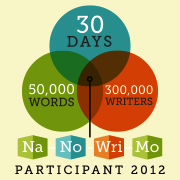 For more information about the challenge, click here. When asked if ‘Teaching English as a Foreign Language’ (often abbreviated to TEFL and in this case used by someone who likes to pretend he is better than it) pays well, my answer is often, ‘yes thank you, fine – if you know where to look’. Which I believe is true to an extent. What I wanted to add, but didn’t, is, ‘but I don’t do this job because I want to be rich’. Don’t get me wrong, I have skills, I’m a good teacher, and have recently looked for a new job that I feel values my input, and reflects my worth and quality as a teacher. I know I deserve to be paid a fair salary, not only do I have certain qualifications that took time to achieve, I put in effort and time to plan lessons, and to realise students weaknesses and nurture them to be more confident. And I love it. But I do this job because I want to be here, as much as anything else. I’m grateful for Thailand for letting me stay and experience the culture, and live here for a while. I’m proud to go to places using public transport – I use the skytrain, motorbike taxis, buses, I love walking even if I do get a little sweaty for my liking. I enjoy popping into 7 elevens a dozen times a day to get ‘snacks’. I enjoy eating firey food from street stalls and restaurants with fold up tables, drinking iced water out of a tin cup with a straw. I enjoy trying to communicate in very-limited-but-getting-there Thai with smiling locals. It’s funny, because for a while I’ve felt a little uninspired, a little too settled here, a little too ‘normal’. I now remember what my goal in life is: to experience, and to learn. And that’s why I’m here. To feel at home in a completely different culture to the one I was brought up with. I think I’ve still got a fair way to go with Bangkok yet, and with Thailand as a whole, I’m sure I have. Sometimes I need to have my feathers ruffled a little bit though, to remind me why I came here in the first place. I’d rather be rich with experience, please and thankyou.